The river is rising and the rapids are raging! Can you help the animals to safety by solving the puzzle? AnimaLogic is a brilliant puzzle game that will have children working their brain overtime to solve these wonderfully smart safari stumpers! Lions, hippos, giraffes, and camels are all waiting to get to the other side of the river, but they can only cross the bridge one at a time. 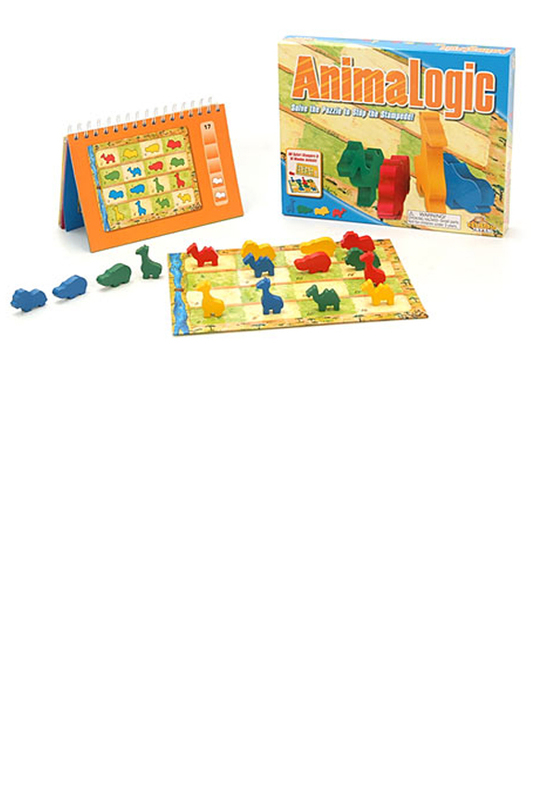 Solve the sequence and then move the animals in the proper order to get them safely to the other side - The puzzle's complete once all sixteen wooden animals are removed from the game board! With sixty puzzles and five levels of difficulty (beginner to advanced), AnimaLogic is progressively more challenging with each puzzle attempt - it's WILDLY effective logic-building entertainment! Expect color and object-recognition, sequencing, and matching abilities to refine quickly - AnimaLogic captures the interest of the whole family. (16) wooden animals in yellow, blue, green and red. 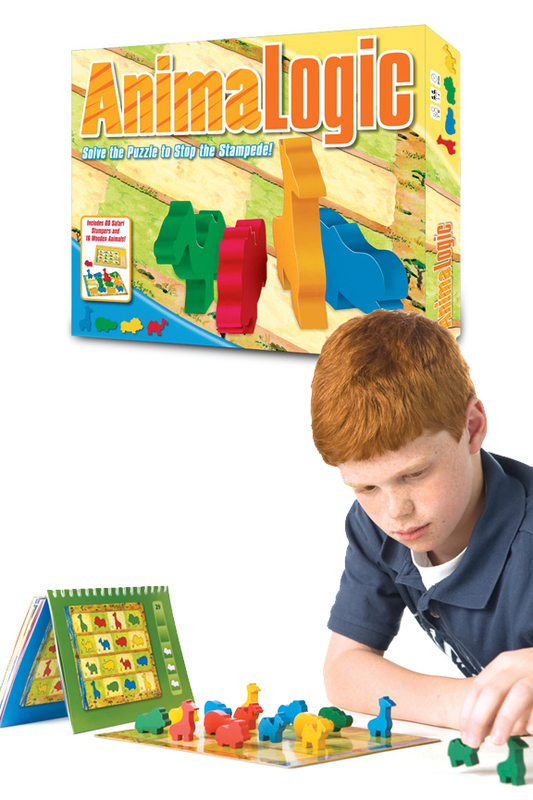 Dimensions 4.5" x 7.5" x 5"
Game play Follow two simple rules. Uses A logic game for the whole family. 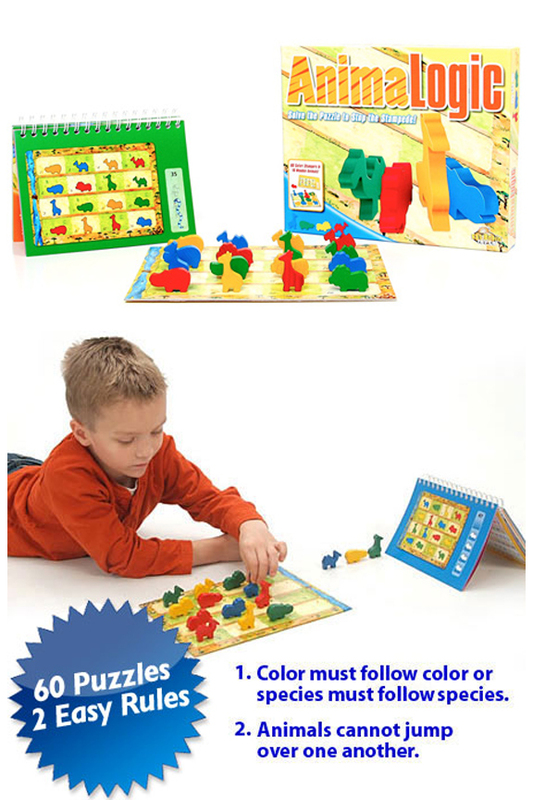 Play and have fun while improving object recognition, sequencing, matching abilities and logic. A smart game for the whole family. Make careful moves, and follow just two rules to eliminate all animals from the board. With 60 puzzles to master, this game offers plenty of challenges for kids of all ages. Order Yours Today! A Modern Twist on the Classic Stacking Block.